Thomas Drayton Simpson was born in Hobart, Tasmania on 23 November 1917, the middle of the three children of Thomas Simpson and his wife. His father was a lawyer, and Simpson himself began legal training before enlisting in the RAAF in 1940. On arrival in England, he was first posted to 97 Squadron at Coningsby in October 1941, and flew five operations on Manchesters. In February 1942, he was transferred to 455 (Australia) Squadron who were still flying the older Hampdens, where he quickly teamed up with Mick Martin. It was Martin that gave him the nickname ‘Tammy’. By the end of June, they were flying Lancasters. By October Simpson had completed a tour of 37 operations, including his spell at 97 Squadron, and was posted to a training unit. In early April 1943, he joined up with Mick Martin, Jack Leggo and Toby Foxlee again, in the new 617 Squadron, practising for the Dams Raid. He received the DFM for his role on the raid. 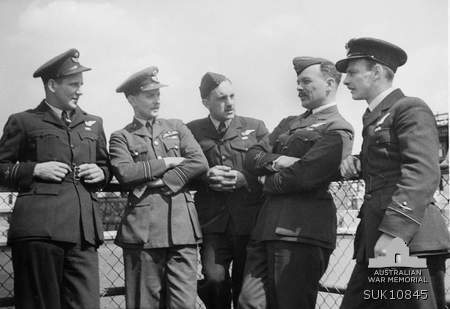 After the raid, Simpson carried on flying with Mick Martin on his subsequent 617 Squadron operations, 14 in all. Like Martin and Foxlee he was taken off operations after the Antheor Viaduct trip, in which Bob Hay was killed, in February 1944. He had applied for pilot training in the autumn of 1943, but in the end he was posted to an Operational Training Unit for the remainder of the war. He returned to Tasmania after discharge from the RAAF, and resumed his law studies. He was called to the Bar in 1949, and worked as a lawyer thereafter. He married Esme Reid after the war and they had four children. Simpson died in Hobart on 2 April 1998. 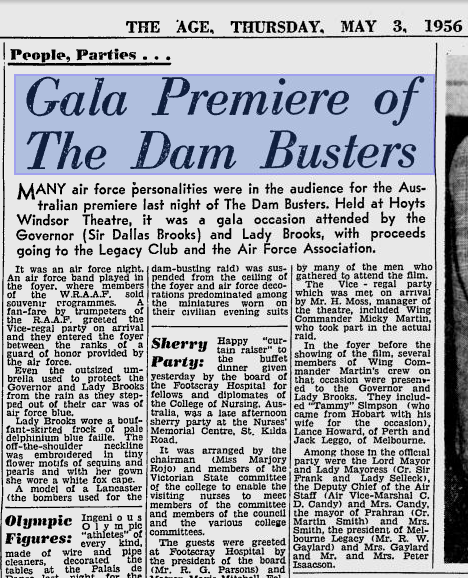 Simpson was a guest of honour at the Australian premiere of The Dam Busters in 1955 and returned to Britain several times for 617 Squadron reunions. Further information about Thomas Simpson and the other 132 men who flew on the Dams Raid can be found in my book The Complete Dambusters, published by History Press in 2018. Thomas Simpson was my grandfather, unfortunately for me I was only about 4 years old when he passed away so I don’t have many memories of him. I think its great that there is people out there who want the world to know who these brave men were. Hi Lucille. My Great Uncle was in his crew at RAF Skellingthorpe. I would really appreciate you or someone from your family getting in touch. I have letters your Grandad wrote to my family. Its been a while since you left this comment George but I hope you see this response sooner than I did! Please respond if you are still interested in getting in contact. In Hopgood’s logbook he lists a Flt Sgt Simpson as his Rear Gunner on the Op he flew to Berlin on 16th/17th January 1943. As there were no other gunners at 106 Squadron, RAF Syerston, at that time with the name SImpson does anyone know if this could have been Thomas? Yes, Clive, this is Tom Simpson. In his book, Lower than Low, he says that he went on a raid to Berlin on 16/17 February with Flt Lt Hopwood. This book is riddled with date and spelling errors, of which these are just two! He names another gunner on this trip as Stan Gawler.